Sit back, strap yourself in, and hit the accelerator for the off-road adventure of a lifetime! Mountain trails through a timber harvested area offer the perfect venue for off-road challenges. Learn about the history, culture and economy of Ketchikan as you are transported by motorcoach to this rainforest wilderness. 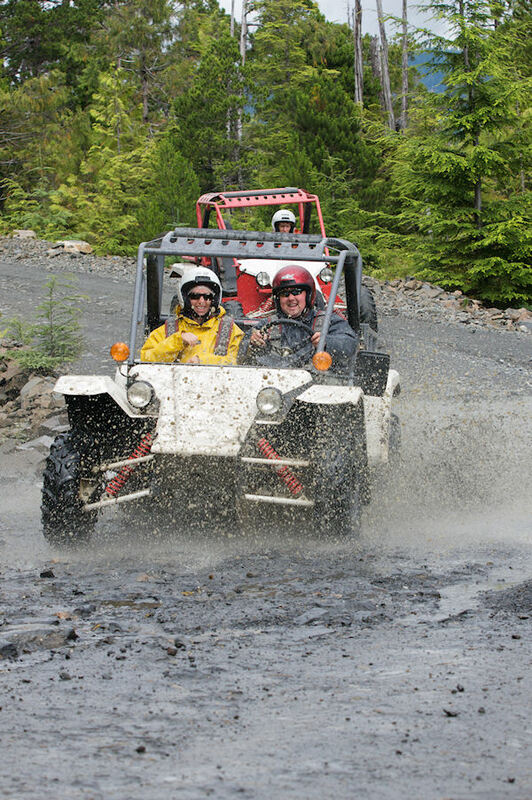 Experience the rugged Alaskan wilderness from the driver's seat of a specially designed off-road adventure kart. Karts accommodate two guests, but karts that seat 4 may be available upon request. Not recommended for guests with neck or back problems or expectant mothers. Participants must be at least 50" tall and weigh between 40 and 300 lbs. Karts accommodate two guests (unless otherwise requested). Rain gear and a helmet are provided for use on the tour. Drivers must show a valid driver's license. Participants must be at least 50" tall and weigh between 40 and 300 lbs. Karts accommodate two guests. Not recommended for guests with neck or back problems or expectant mothers. A liability waiver is required to be signed in the presence of the tour operator. In addition to the waiver, children under the age of 18 must also have a signed parental consent form to participate without a parent or guardian. Rain gear and a helmet are provided for use on the tour.